Campaigners have won a battle against plans to increase quarrying near an ancient monument in North Yorkshire. They argued the area is of national archaeological importance. Councillors agreed and rejected the plans. Tarmac said it would appeal against a decision to refuse its plans to quarry tonnes of sand and gravel at Ladybridge Farm, near Thornborough Henges. The land could cope with the quarrying said Tarmac, adding it hoped factual evidence would prevail at its appeal. North Yorkshire County councillors voted 6 to 3 to reject the application at a planning meeting on Tuesday. Tarmac's estate manager Bob Nicholson said the decision threatened the livelihoods of more than 50 people and had serious implications for the supply of sand and gravel to the construction industry. He said excavations on the site had found limited evidence of prehistoric activity and it did not meet the criteria to qualify as being of national importance. "Our proposal for Ladybridge, which actually moves quarrying further away from the henges than our current operation, poses absolutely no threat to the ancient monument, which is protected by law. "Yet throughout this anti-quarrying campaign, protestors have, through misleading statements and images, claimed that the monument is threatened. "We maintain that our application is both justified and reasonable and we will mount a robust case for its approval at appeal, when we hope that factual evidence will prevail over mythical invention." 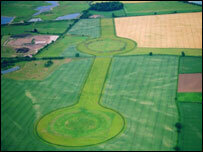 The henges are believed to be one of Britain's largest ritual gathering places from the Neolithic period. Local campaign group Timewatch collected more than 10,000 signatures for a petition against the scheme, which it said would contribute to the permanent loss of nationally important archaeology. US-based conservation group the Landmarks Foundation also voiced its concern at the quarry proposals, describing them as a tragedy. Councillor John Fletcher, who chaired the planning meeting, said: "Because of the well articulated arguments from all sides it was a very hard decision to make. "However, the right decision was made." Tarmac already has a quarry at Nosterfield, close to the ancient henges which consist of three earthworks built in a line running north-south for about a mile. Workers at the Nosterfield Quarry and local building firms sent in 80 letters and a 350-signature petition arguing that their livelihoods depended on the application's approval.